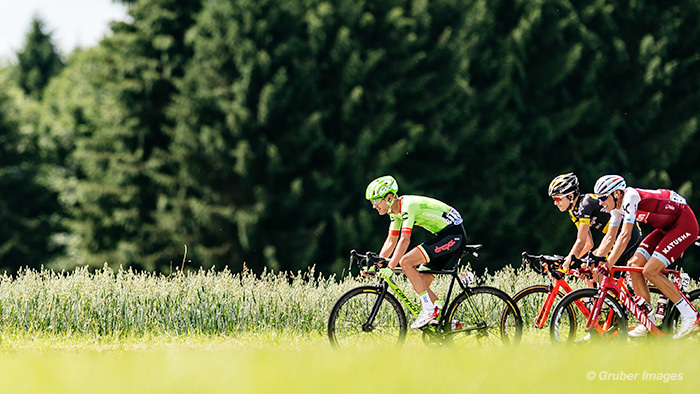 Stages 2 and 3 of the 2017 Tour de France saw some breakthrough performances for Cannondale Drapac. Let’s take a look at how other riders responded to Taylor Phinney’s fantastic early breakaway in Stage 2, grabbing the Polka-Dot Jersey, and how his teammate Nathan Brown followed his lead in Stage 3 to claim it for his own. Stage 2 was the first road stage of the Tour de France as it left Germany and headed to Belgium with the finish in the famous cycling city of Liege. The rain was again present for much of the stage until the final run into the city of Liege where the riders were welcomed with dry roads. The day was full of activity as crashes that brought down some of the main GC contenders and caused a fright to many. The main talking point of the day was the early four-man breakaway, which went as the flag dropped at the start. This group consisted of the American Taylor Phinney (Cannondale – Drapac) who went on to claim the polka dot jersey at the end of the stage. Both Phinney and breakaway companion Yoann Offredo (Wanty-Gobert) were only to be caught in the closing kilometres after an epic fight to stay in front. The race finished in a bunch sprint with the German powerhouse Marcel Kittel (Quick-Step Floors) taking the stage in a hotly contested sprint. With the route for this stage being in favour of riders such as Kristoff, it was expected that the Katusha-Alpecin team would be to the fore during the stage. Kristoff was down as a favourite among a handful of others to take the stage and after his solid performance in Stage 1’s TT it is clear that he is in form. The first hour was taken easily for Kristoff as he averaged 184w, 2.46 w/kg with a low heart rate of 113 bpm average during this time. The first spike in effort came at the intermediate sprint which was after 82.5 km of racing. These sprints are critical for any riders with ambition to go for the Green Points Jersey and they are fiercely contested, as we can see from his data. In the ramp up to the sprint Alexander did one minute at 431w, 5.71 w/kg before he then unleashed a powerful 30 second effort in the last 450m to the sprint line which saw him average 709w, 9.39w/kg and maxing at 1233w, 16.33 w/kg. This effort was enough for him to win the intermediate sprint ahead of Sonny Colbrelli (Bahrain-Merida) and Michael Matthews (Sunweb). This would have given him confidence for the final sprint to the line in Liege. The race started to ramp up the pace as they pushed hard through the wet conditions to bring back the leading duo of Phinney and Offredo. On the on final climb of the day, Cat 4 Cote d’Olne, the break still had a substantial advantage and the effort can be seen here in Kristoff’s file. On this climb he rode at an average of 414w, 5.88 w/kg for the 3:03 it took for them to crest the climb. They rode up this climb at a very fast 32.8 kph. From this point to the finish it was all about positioning for him and his team as they made sure they had their team sprinter close to the front. In the sprint for the line Kristoff’s poor positioning in the final 2 km made it hard for him to make up ground as the leading teams pushed close 60 kph in the lead out to the finish. If we look at the final 4.2km he rode at an average power of 406w, 5.36w/kg averaging a staggering 57.7kph and maxing out at 70kph. This final 4.2km took him 4:23 minutes to complete. The final 500m of the sprint saw Kristoff try to make up places as he was caught too far back and made a big initial effort to push closer to the front. In the final 500m he averaged 640w, 8.47w/kg, hitting a max of 1248, 16.53w/kg. This effort was enough to see him finish 15th, which would have been a disappointing result for one of the pre-stage favourites. The first road stage is always a nervous affair and I am sure the majority of riders will be content they finished safely without too many serious hiccups. For Kristoff, this stage would have ended as a frustrating one. With the proof that his fitness is good after great Stage 1 TT and winning the intermediate sprint, his confidence for a result would have been high going into the sprint. Poor positioning and not getting his lead-out perfect would have played a big part in him not getting the end result he was probably looking for. If we look at his finish sprint we can see that he had to hit his peak power with 490 m to the line, having to go so deep with still some distance to the line meant he needed to make up a lot of places early to get into position which left him under par when the “real” sprint for the line started with 250m to go. I expect Kristoff to seek his revenge later in the week. What was set to be a hard day in the Ardennes as the races passed from Belgium to Luxembourg with a finish in France did not disappoint. A very hard start with lots of climbing and rolling roads saw a group of four take charge and leave the bunch behind. However, unlike Stage 2 they were never allowed to gain much advantage over a peloton who wanted to make sure it was a bunch-kick at the end—which was on the top of a hard 1.7 km climb. It was again a big day for Cannondale Drapac as American Nathan Brown rode hard in the break all day and was rewarded with the Polka Dot Jersey at the end of it, taking it off teammate Taylor Phinney. The finish saw Sagan again show his powers on a hard uphill sprint, taking the win from a fast approaching Matthews. It was a day that Nathan Brown will remember for a long time after his exploits on the hilly roads which greeted the riders on today’s stage. Brown was on the attack from the start today as many riders were aggressive and wanted to get into the “early” move. This is proof that it is very hard to get into one of these early breaks and the effort required to get into this move may be the biggest effort the riders will have to do all day, which is the case with Brown on Stage 3. Brown was to be in the break for a total of 163 km, 4:05:00, normalizing 320w, 4.92 w/kg for the time he spent in the break. A real hard day for Brown but one which reaped rewards as he gained the Polka Dot Jersey. The cohesion of this four-man break was to falter when Nils Politt (Katusha-Alpecin) pushed ahead over the top of Cat 4 Côte de Wiltz, this caused both Brown and Politt to forge ahead with still over 100 km to go. On the next climb of Cat 3 Côte d’Eschdorf 2.3 km-long climb at 9.3 percent is where Brown stamped his authority on the Polka Dot Jersey as he left Politt early on the climb to make sure he secured the first place over the top of the summit. On this climb Brown averaged 433W, 6.66W/kg for 6.5 minutes in the first 2.1 km of this hill. Brown attacked and did a 40 second effort at 615w, 9.46 w/kg for this duration and maxing out at 930w, 14.3 w/kg. This is proof that he made an extremely hard attack and concerted effort to drop Politt. Brown was to be caught later in the stage as the peloton was pushing the pace to bring back the leaders and make sure it ended in bunch kick on the hard, uphill finish. One of Cannondale Drapac’s leading riders, Rigoberto Uran, was to the fore at the end of the stage. He was there to make sure he did not lose time on the GC to the other main contenders, but also to help his teammate Alberto Bettiol (ITA) who was to finish fifth at the end of the stage. Uran had a relatively easy day (compared to Brown) but he had the requirement to be at the front on an extremely hard run into the finish. He did the Last 3.56km: 5:15 at 442W, 7.02W/kg but had a massive effort in the final 1.70 km climb, which was a 5.7 grade, taking him 3:18 at 475W, 7.54W/kg. He hit a max speed of 30.9 km/h on this steep finish with a max heart rate of 188 bpm. We can see from these stats that it was not a short punch to the line but a long drawn out effort over that last three minutes of racing. With only losing two seconds to eventual winner Peter Sagan at the finish, it shows again that Rigoberto Uran will be to the fore on the hillier days and we will likely see him play a bigger part in the higher mountains with teammate Pierre Rolland. The massive effort in Stage 3 by Nathan Brown shows that Cannondale Drapac are serious about the Polka Dot Jersey and their aggressive start to the TDF will continue during this year’s race. Brown’s massive effort today will take a while to recover from, hitting a TSS of 360 compared to that of teammate Uran who hit 237 TSS. Brown’s ability and power produced on the short climbs today shows he will have the punch to fight to keep the jersey on the smaller climbs over the next week, and we could again see him on the attack, perhaps on stage 5, to consolidate his lead. The power Brown produced during the stage on earlier climbs was higher than many riders who rode top-20 at the stage finish, this again proves he has come into the Tour in incredible form.